Registration is now closed. Due to the popularity of the camp, students will be selected by lottery and notified via email by Thursday, January 11, 2018. 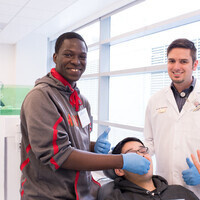 Junior high and high school students (6th–12th grade students) from throughout Northern California are invited to a one-day, fun-filled dental camp in San Francisco to learn about careers in dentistry and oral health. WHEN AND WHERE IS DENTAL CAMP? For more information, contact Stephanie Chan at 415.780.2093 or schan@pacific.edu.